Babies cry for a number of reasons. For newborns especially, it can be difficult for a parent to figure out what their child’s crying means. Often, you’ll be able to find some specific reason, like a physical need or irritation. When your baby is crying, try going through all the possible reasons for it one by one and see if you can use the process of elimination to get him or her to stop crying. If you have no success in finding a reason, try simple soothing strategies like holding, rocking, singing, going for a drive, or using white noise to calm your baby down. All of these things may work, but sometimes your newborn baby crying might not be due to any particular cause. And some babies cry more than others, simply because they have more sensitive or strong-willed temperaments. When you’ve ruled out all the possible causes and are sure your baby is healthy and not in need of anything, listening to your newborn baby cry and cry can be a nerve-wracking experience! When the crying keeps going and you feel yourself becoming increasingly stressed, anxious, and upset, then it’s time to focus on you. Here are some tips for staying calm with a crying baby. Try to slow down and center yourself. Close your eyes and imagine yourself in a place that makes you feel safe and calm, or count to 10. You can even put your baby in his or her crib and go into another room for a moment, make a cup of tea, or even step out the back door. This does not mean that you’re giving up on your child or that you’re failing as a parent. 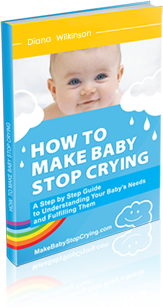 Sometimes, just like with older children or even adults, your baby may simply need to cry for a while. Movement can be a great way to get your baby to calm down, but even if your baby still keeps crying, moving around just might help you! You can put your baby in a sling or a stroller and go for a walk, or even buckle him or her into the car seat and take a drive. Your favorite walking route, park, or scenic road may help ease your tension a little, and the act of walking or simply getting fresh air and a change of scenery can be calming. It is quite important to never be afraid to ask for help. If you start feeling overwhelmed, then it is definitely time to reach out to your partner, a family member, or a friend. They may be able to take over watching your crying infant for a while and let you take a much-needed break. Remember to always remain gentle with your baby; never shake a baby, as this may cause serious and permanent damage. Parenthood just might be the toughest job on the planet, so if you have concerns about your mental or emotional well-being, don’t hesitate to contact your doctor or a support line!